Westcountry Rivers Trust (WRT) recognises that fully functioning, healthy soils provide natural filtering and buffering processes that capture, trap and mitigate losses from land to watercourses, whilst supporting farm productivity and boosting biodiversity. Soils play a primary role in regulating the supply of pure, clean water. Soil degradation in poorly managed watersheds can cause changes in water quality that negatively affect the health of our rivers and receiving coastal waters. There is an urgent need to prevent flooding but also to provide sustained water supplies in dry weather. With growing interest in Natural Capital, Natural Processes and Environmental Markets, WRT proposes that it’s time that our humble soils received the attention they deserve for their fundamental role in the water cycle. More than two-thirds of land in the UK is used for agriculture. Soil degradation on farms is indicated by declining concentrations of soil organic carbon (SOC) caused by poorly managed cultivation and the loss of top soil by erosion. Adequate SOC is required to maintain the structure of soils that we rely on to control the rate of water moving into and through soils, and to remove impurities and pollutants from water before it reaches waterways. Increasing stocks of SOC (also called carbon sequestration) on farms is one of the few options currently available to reduce CO2 concentrations in the atmosphere that cause climate change, thought to be responsible for the increasing unpredictability of our weather. Discussion in the Tamar Catchment Based Approach Partnership led to the establishment of the On-Farm SOC Project in 2015, that was instigated by Hazel Kendall (Head of Land Management, WRT) in partnership with the Tamar Valley Organic Group (+B) and overseen by Prof. Jennifer Dungait at Rothamsted Research. The project investigated the relationship between SOC stocks and land use management options on real farms in southwest England. 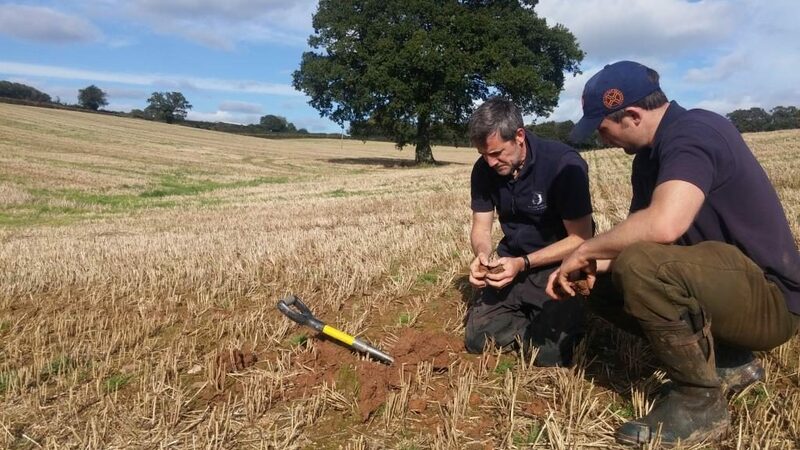 A primary objective was to establish a reliable sampling protocol for SOC that could be applied on-farm that would provide farmers with the evidence of their capacity to manage SOC stocks and to improve soil structure. Ultimately, this included the potential to use SOC as a tradeable commodity for carbon offsetting schemes, and the ability to deliver local multiple ecosystem benefits including water quality and supply, as the payment for ecosystem service (PES) market evolves. The significant results of this unique preliminary project confirmed that farmers can use land use change to increase SOC stocks and to improve soil structure. This gives farmers the option to make management choices that optimise the mosaic of land uses and field conditions on their farms to balance food production with carbon sequestration, and to manage the water cycle on their farms because better soil structure can improve infiltration and reduce runoff and flood risk and improve water quality. In 2019, WRT will begin Phase 2 of the On-Farm SOC Project through the Channel Payments for Ecosystem Services (CPES) project. CPES aims to develop alternative markets and mechanisms to support PES with particular regard for water quality including reducing the occurrence of algal blooms which result from nutrient enrichment in waterbodies. Phase 2 will extend data collection at both the farm- and catchment-scale to provide an extended dataset of current and potential SOC stocks, exploring the relationship with reduced nutrient and soil loss to watercourses as healthy soil function is restored as part of a suite of recommendations delivered through tailored farm advice. This PES approach holds the promise to enhance economic and environmental sustainability of farm businesses with additional and multiple benefits to society that presents potential alternative and sustainable markets for farmers in the longer term.